Gianni Di Giovanni (born July 3, 1963 in Potenza, Italy) is an Italian journalist, Head of Eni's international relations team in Washington D.C., Chairman of Eni Petroleum and Chairman of Eni USA R&M. 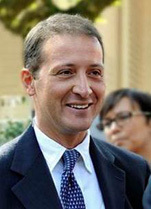 Di Giovanni completed a degree in Political Science in 1986 at the Sapienza University of Rome. He then worked for the IRI for six years, before completing graduate studies in Journalism at the Catholic University of Milan. Di Giovanni was one of the early proponents of new media, as well as the relaunch of traditional media such as radio, spending 15 years working for telecoms across South America, Eastern Europe, India and China during major open market and privatisation processes in these regions. Since October 2015, Di Giovanni has served as Chairman of the Board of Directors of Eni Co Inc. He is also Chairman of the Board of Directors of Eni USA R&M Co. Inc., a company which produces and distributes lubricants in North America. Since October 2015, he has served as Executive Vice Chairman of Eni's Washington D.C. branch office, a role through which he works to safeguard and promote Eni's interests in the USA, interfacing with local public institutions and authorities, assessing markets and advising the company on growth opportunities. He is the Editor-in-chief of the platform ABO - About Oil and print magazine Oil, prestigious energy news publications, as well as the periodical Professione Gestore, a publication through which Eni communicates with managers throughout Italy, providing them with information on business strategy, promotional initiatives and new products. He is a member of the faculty at the master programme in Media Relations and Communications at the Graduate School of Media Communication and Performing Arts at the Catholic University of Milan, as well as at the master programme in Digital Journalism at the Lateranense Postgraduate Centre - CLAS at the Pontifical Lateran University in Rome.